Reading a line on a fd is way too tedious. The aim of this project is to make a function that reads a file and at every call returns a new line from that file. From a file descriptor get_next_line(const int fd, char **line) will place in a pointer to string line the next line of an input that hasn’t been read yet from a certain file descriptor fd. A line is a strig ended by a ‘\n’ or by a ‘\0’. It returns 1 if has read something, 0 if there are no new line, -1 if there is an error (wrong file descriptor, inexistent original pointer to string). The function has to work with any length of new line and has to work with a BUFF_SIZE for reading a file from 1 to 9999. As bonus this one has to work with multiple file descriptors at the same time and use only ona static variable and no global variable. The function uses only one static variable to remeber what is left from the last call from read. This static memory is a pointer to a pointer. on the first level thre are multiple slot of memory. Each of this slots is unique for each filedescriptor, it will point to a string that will have the remainder buff from the last call to read if the file descriptor has been called. The function will check if there is a past buffer left every time it is called and add it to the result line. then it will go read the actual file concatenating what has been read at every loop of read. when it encounters a buffer with a new line it concatenates to the result line only the buffer till the new line and the new buffer will be updated to the sub string after the new line. Here is an image of printfile. 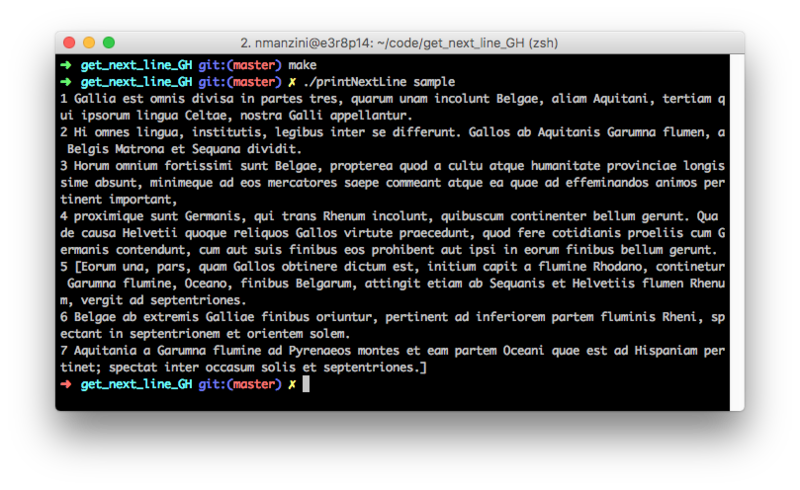 it is a function that uses this get_next_line to print out every line from the file paths passed as arguments. In this sample I used the first few lines of “Commentarii de Bello Gallico”.